A new set of unredacted documents provided by the Municipality and the Water and Sewerage Utility of Lezha (UKL), following a freedom of information request by Exit, throws a new light on the implementation of the €14-million-euro project, financed by the EU in the context of the Instrument for Pre-Accession (IPA), and managed by project manager Hubert Grandjean at the EU Delegation in Tirana. What happened from June to December 2016 appears to have been an exercise in multiple levels of the Albanian government working against each other, causing the extensive delays in the implementation of the EU-funded project. Needless to say and despite the request of the Prime Minister, the construction work was not completed by June 15, 2016. According the meeting yesterday in the offices of the delegation, contractor Spiga srl was asked to fulfill our requests within the month May, mid July the latest. From verifications made on site it was noticed that the presence of the representatives of the contractor according to the terms of the contract is not being implemented. On the working site there is no representative of Spiga but only of the subcontractor. For this we request the Delegatio to take the necessary measure against this Firm. 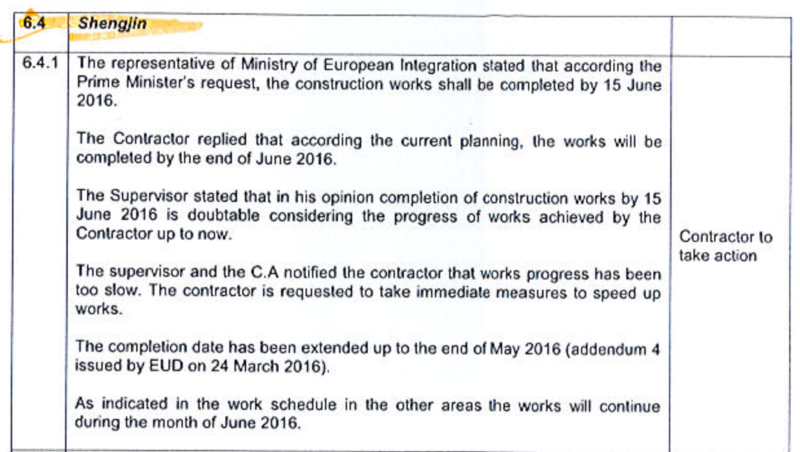 According to Bicaku, one of the main reasons for the delay is caused by the contractor Spiga srl, which apparently is not fulfilling its contractual obligations, and it is clear from the memo that the EU Delegation in Tirana has been made aware of this. Interestingly, the Supervision Report of June 2016 does not mention that Spiga representatives are absent from the construction sites. But the contractor appears not to be the only reason for the delays. Six months later, on December 19, 2016, executive project manager Palladino writes to Bicaku about problems with the construction of a wall at pumping station 1. Apparently, the UKL does not agree with the height of the wall. On December 20, Bicaku writes an email to Mayor of Lezha Fran Frrokaj from his personal email address (his work account had been suspended), in which he mentions that the UKL is preventing Spiga from continuing work on the pumping station. Despite the constant communication of the European Delegation and Contractor Spiga with the Administrator of the administrative unit Shëngjin, the issue of the completion of the works for Station No. 1 has still not been solved. The impossibility of implementing the project for this station will cause the entire network built so far to be dysfunctional, and will have other financial consequences, which concern the immediate suspension of the investment made for Shëngjin and the request to return the financial value of this investment to the EU Delegation. In other words, the EU Delegation is by now threatening the central government that if the wall at pumping station 1 cannot be built according to specified height of 3 meters, it will demand a return of the entire investment. So the entire, multi-million-euro project now depends on a conflict about the height of a single wall. Bicaku’s internal memo of June 9 already mentioned that the contractor was correctly adhering to the contract. It should be stressed that it had signed this contract after its predecessor had declared bankruptcy, and it is at this moment still unclear how this contractor was chosen. The EU has failed to provide any procurement documentation relating to the contract with Spiga srl. According to the “Supervisor’s Organization Chart and relation with the Contractual Authority and Beneficiary,” included in the documents provided by the Municipality of Lezha, IPA Coordinator Bicaku was in direct contact with the Contracting Authority’s Project Manager, Grandjean. It is therefore difficult to believe that the EU Delegation was unaware of Bicaku’s observations that personnel of Spiga srl was absent from the construction sites. In reference to your letter […] of 27 July 2017, we take not that you do not accept [EU Delegation] arguments for the application of liquidated damages and that you declare having sufficient proof and documentation to justify all the delays. Therefore these reasons cannot be used again to justify further delays experienced as from March 2016. Besides, works meeting 37 of 30 March 2016 notes that the slow progress in March and insufficient resources affected to works in Shengjin and Ksamil are contractor responsibility, warns on consequences of completion days, and requests that resources work teams and progress be increased immediately to ensure works substantial completion by the end of May 2016. You will also recall that the EU delegation also suggested that partial commissioning of completed parts of the works in Ksamil and Shengjin take place as early as possible and to the largest possible extent. However this did not occur. This being said, the EU delegation is aware of the difficulties experienced in general in Shengjin and Ksamil sites, including the constraints during the summer season 2016, and is willing to take into account any delays if justified. It is unclear why the EU Delegation would be “willing to take into account” “justified” delays, after arguing that all delays had already been included in the granted extensions. Any company, especially Italian ones, should be very well aware of the difficulties of working with Albanian bureaucracy and in the Albanian context, and should include these as part of the commercial risk they take. Instead, by being accommodating, the EU Delegation supports the wilful and documented negligence of the contractor, and may even reward him by (partially) waiving the liquidated damages. Naturally, the actual sum of damages invoiced (if any) by the EU Delegation remains – yet again – confidential.